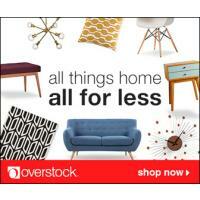 Welcome to Overstock.com, an Internet leader for name-brands at clearance prices. At Overstock.com we help you shop smarter, by offering top-quality name-brand merchandise at 40 - 80% off, every day of the week. At Overstock.com you'll find your favorite brands.